Palatine Park District will host the annual Hound Egg Hunt on Saturday, April 13 at 10:00am at Towne Square, 150 W. Palatine Road, Palatine. Check in will begin at 9:30am. 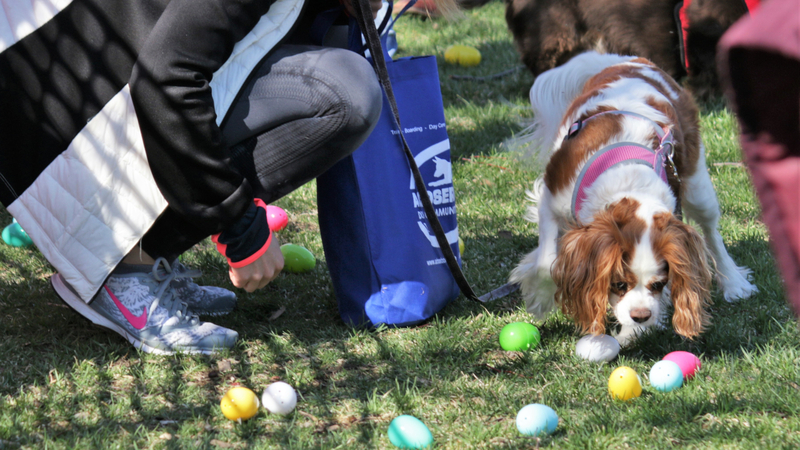 This fun and enjoyable event consists of one egg hunt for small dogs at approximately 10:15am and a separate egg hunt for big dogs at approximately 10:25am. A souvenir photo with a bunny mascot, eggs filled with treats, goody bag, and raffle entry are included in the registration fee. In addition to the egg hunt, participants will have the opportunity to visit with community sponsors. All owners must always have a leash and an eye on their dog. All dogs must be wearing a current rabies tag and Palatine residents must wear the Village of Palatine issued license tag to participate in this event or they must leave the area. This is a Village of Palatine ordinance and is therefore a requirement to participate in this event (Sec. 5-40). Non-residents must bring current identification along with required paperwork to register for the event. The pre-registration fee is $8.00 per dog until Friday, April 12 at 4:00pm and will increase to $10 per dog the day of the event. Registration is accepted online at register.palatineparks.org or in person at one of three District registration offices, Birchwood Recreation Center, Community Center, and Falcon Park Recreation Center. This year’s presenting sponsor is A Closer Bond Dog School. Gold level partners include Deal With Diamond Realty – Amy Diamond, Eric Esch State Farm, Grade Power Learning – Palatine, and Buffalo Grove Animal Hospital. For more information about this event, contact Special Interest Coordinator Lisa Schroeder at 847.496.6347 or lschroeder@palatineparks.org.